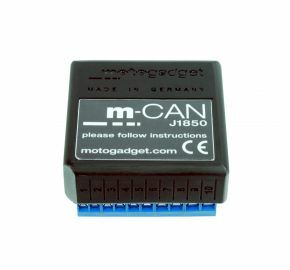 The m.CAN J1850 is a digital adapter for a hassle-free connection of our instruments PLUS indicator lights to the stock Harley-Davidson™ wiring harness. No soldering or crimping necessary, so the warranty remains intact. You will receive the specific plug connectors required for the connection. Just connect the wires of the instrument, indicator lights and of the included plug connector. Then plug this side of the plug connector into the specific connector of your bike and you are ready to go. Almost plug & play. The m.CAN J1850 fits all Harley-Davidson™ with a TwinCam engine from 2004 and later that have DEUTSCH plug connectors and the dashboard on the tank. It also fits all Harley-Davidson™ Sportster models from 2004 and later that have DEUTSCH (XL DEUTSCH) or MOLEX (XL MOLEX) plug connectors. Furthermore it can be used for all Harley-Davidson™ Vrod motorcycles that have DEUTSCH (VRSC) plug connectors. Not compatible with models that use the Harley-Davidson™ LAN bus system and all Rocker or Dyna-models which utilize the instruments at the triple clamp.